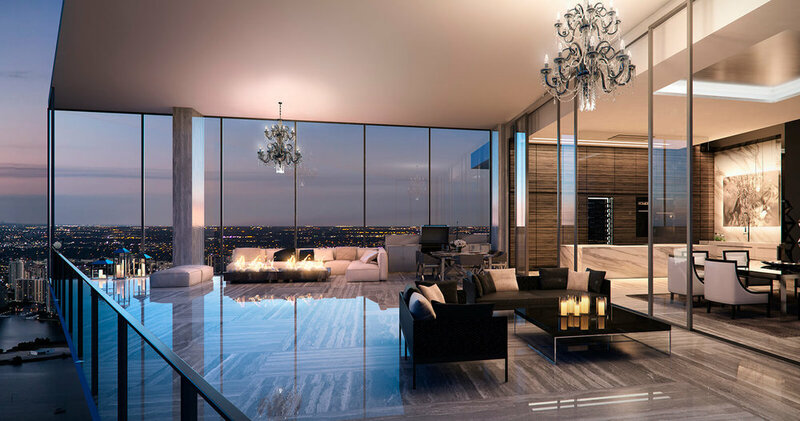 There are many reasons why more and more people dream about making Miami its permanent address and one of the most alluring is the exclusive choices of luxury residential properties in the area. Not only are they enhanced with sumptuous amenities and white-glove services, but the privileged buildings’ settings can afford the most striking waterfronts, panoramic water views and warm bay breezes elevating owners’ lifestyles to its most. With its incredible panoramic ocean and Intracoastal views and inspired fully finished interiors, this high-end luxury boutique building is the epitome of luxury living in the heart of Sunny Isles. The tower offers only two residences per floor featuring Italian entrance doors, marble and wood floors, and 12’ ceilings, with incredible views from each unit. Apart from the complex’s state-of-the-art technologies, Muse features oversized terraces with summer kitchens, stunning interiors by Antrobus and Ramirez, and the most pampering amenities including a serene infinity pool and spa and a breakfast room overlooking the Atlantic Ocean. Murano Grande is three tower complex set right on the Fifth district of Miami Beach. This development is all about space, so if this is what you’re into, you’ll definitely love it. This lavish residential development has some of the largest condos around, paired with a comfy, contemporary, and stylish lifestyle. A grande dining room with adjacent oversized sunrise/sunset, terraces with glass and aluminum railings; elegant, smooth 9-foot ceilings and ocean to bay flow-thru floor plans with panoramic views are just some residence features. Amenities in Murano Grande include heated bay front swimming pool and spa, lighted tennis courts and a fitness center. Rising from the combination Miami white sands and its warm Atlantic Ocean waters, Eighty Seven Park features 70 refined homes packed with open areas and the most impressive ocean views. This striking building is filled with natural light, along with natural stone, and materials like oak grains gracefully blending with the ambiance of this enchanting community. You’ll love the incredible views from the floor-to-ceiling windows, balconies, and terraces. Ten-foot-high ceilings give you a sense of space, while the elegant fixtures in kitchens and bathrooms like stone countertops, Italian cabinetry, and Zucchetti accessories. Eighty Seven Park also hosts upgrading amenities like an Apple (Smart) Center, refreshing pools and cabanas and a wellness center. Bristol Brickell is a stunning 40-story resort style condo, overlooking the awe-inspiring Biscayne Bay. Designed by Luis Revuelta, this elegant residential tower is known as the most luxurious buildings in the area featuring just 147 residences with expansive city and bay views and large floor plans. The building is surrounded by lush landscaping and has ideal bay front access while amenities make you feel like living in a resort: a latest-equipment fitness center, an outdoor tennis court, and an exclusive swimming pool. Also you get to soak up 5-star service every day. 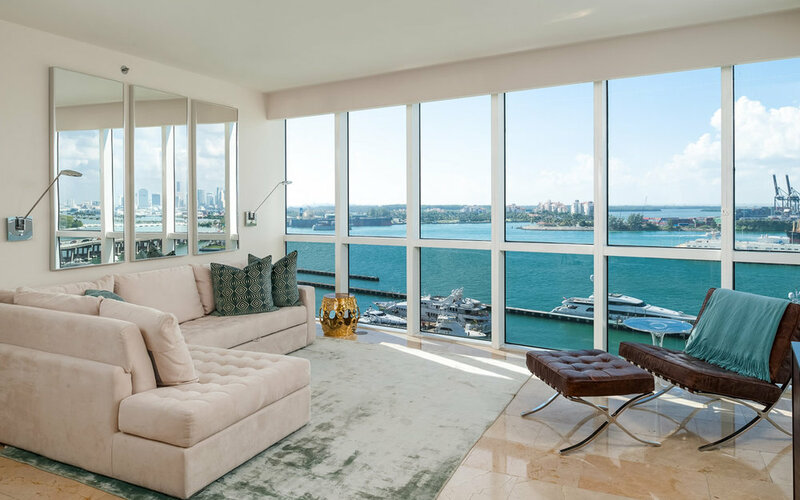 Completed in 2005 by renowned architect Philippe Starck and legendary developer Jorge Perez, Icon South Beach is a 40-story building boasting incredible views of Biscayne Bay from every room. Icon offers a variety of condos to choose from with 1 to 6 bedrooms, all of which have some of the most luxurious features around, like expansive terraces, European cabinetry, and spacious walk-in closets and top-notch amenities like two amazing pools where you can soak up the sun and relax, an elegant café with soaring 24-feet ceilings, a fully-equipped fitness center and spa. Services like round-the-clock security and receptionists, concierge services, and valet parking are also available.